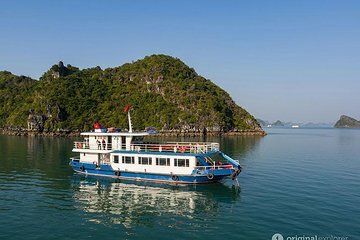 Visit Halong Bay in one day on a deluxe tour that travels round-trip from Hanoi. Make the 1.5-hour journey to Halong Bay by luxury bus, then board a comfortable boat for your cruise around the UNESCO World Heritage Site. See limestone islands with caves, hidden lagoons, floating villages, and fish farms, and have the option to kayak, swim, and watch the sunset. Lunch and refreshments are provided. Your personal expenses and what not mentioned above.